It's been too long since I wrote about, you know, actual science. Today I'm going to cover two recent papers from the Rinberg lab, which has been on fire lately. While the core coding strategies used in the visual, auditory, and somatosensory systems are generally well defined, much less is known about coding in olfaction. Many people have imaged the glomeruli that receive input from olfactory sensory neurons, which is certainly useful, but far fewer have actually recorded from the mitral cells directly in vivo. Many basic questions like, how many odors a neuron can respond to, or what a typical response is like, are still unknown. To answer these questions, Shusterman and colleagues recorded from awake, head-fixed mice while presenting odorants. When they aligned mitral cell spikes to odor onset, they found that responses were quite "sparse." (panel a, top; panel c/d, black trace) (People love talking about "sparseness" in olfaction without ever really defining it well.) However, given how important the sniff is, they then aligned their responses to sniff onset (panel a, middle; panel c/d blue trace). When they did so, they found that odor responses were in fact quite strong. Of the 467 cell-odor pairs they recorded, 59% percent responded; and of those responses, approximately half were excitatory and half were inhibitory. While breathing is fairly regular, they went one step further, and "warped" all the breaths to the same reference breath. To do this, the segregated the breaths into inhalation and exhalation phases, and stretched/shrunk time to fit these standard phases. When they did this, they saw an increase in the magnitude and precision of neuronal responses (they'll get back to this). Next they asked when these responses arrive during the breathing cycle. To do this, they calculated the first point at which the response was significantly different from the baseline response (panels a-c below). 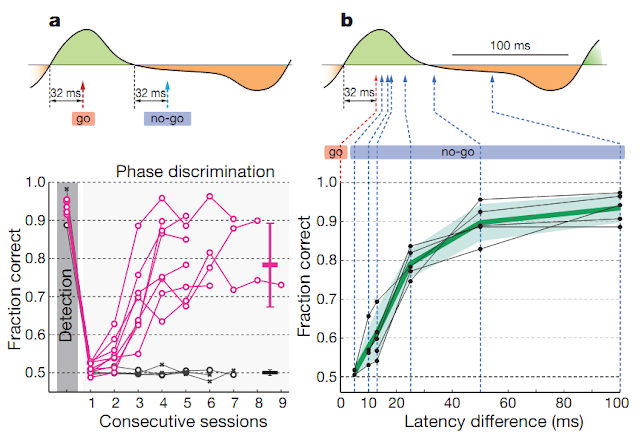 Once they identified the latency of all responses, they plotted the cumulative latency, and showed that the responses "tiled" the breathing cycle. 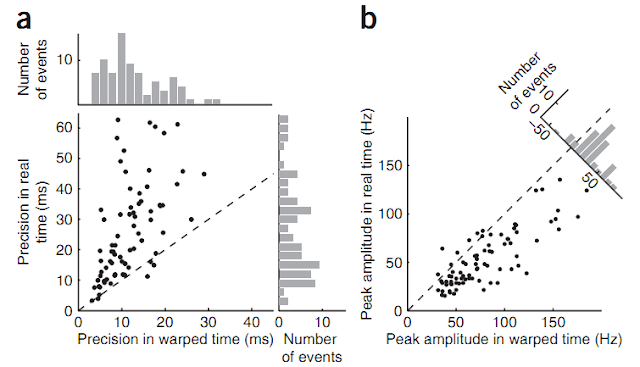 In their words, "The latency distribution of these sharp events tiled the sniff cycle (range, 43–324 ms; Fig. 4d). Given this precision, reliability and sniff cycle tiling, we estimate that in each 10-ms window of a sniff in the presence of odor, a new ensemble comprising roughly 0.5% of mitral/tufted cells (approximately 250 cells in the mouse) will begin a sharp excitatory response." Neuronal responses tile the breathing cycle. a-c. Three example responses during baseline (grey) and to odor (color). The latency to response is shown as vertical black bar. d-e. Response latencies for excitatory (red) and inhibitory (blue) cell-odor pairs. Perhaps this is a semantic argument, but I dispute that responses tile the entire breathing cycle. They claim that the latencies fall in the range of 40-325 ms, but looking at the distributions above, a majority of responses fall in the range between 60-200 ms, or about half the breathing cycle. This makes intuitive sense: the delay is due to the time it takes for the sensory neurons' G-protein signaling to run its course; and the dropoff after exhalation can be explained by a lack of odorants in the olfactory epithelium. In the later stages of the paper, they looked at the precision of the responses, and how well they predict the odors (which I'll skip). To calculate the jitter of responses, they calculated the standard deviation of the first spike following a long inter-spike interval. For the simple breath-aligned responses, they found the jitter was ~23 ms (panel a; below). 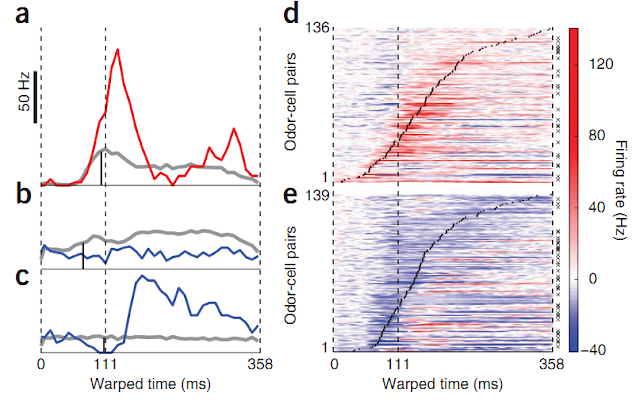 They then calculated the jitter in warped time, and found the jitter was much lower, ~11 ms. From this they conclude: 1. that the olfactory system has much more precise firing than previously believed; and 2. that warping breaths is a good idea. 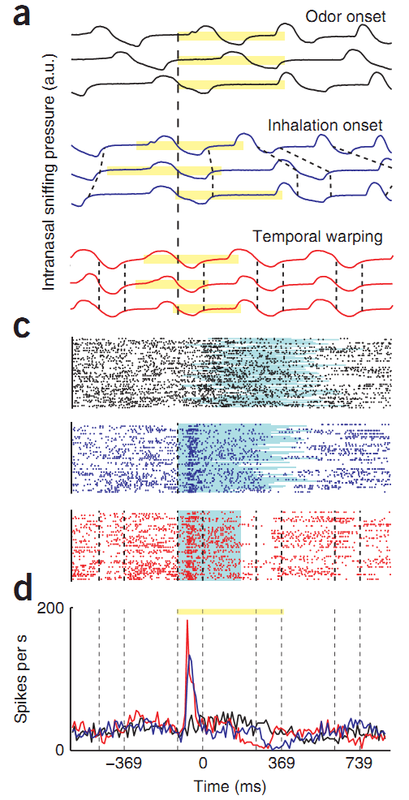 As a second way to look at the value of warping breaths, they calculated the peak response amplitude in real time and warped time, and found that responses were generally larger in warped time. Time warping increases response precision. a. 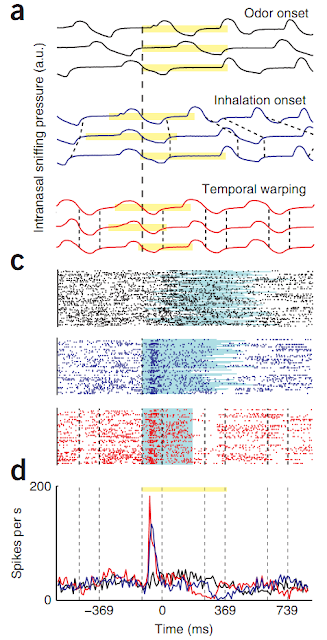 The jitter of excitatory responses is larger in real time than in warped time. b. The amplitude of excitatory responses is higher in warped time than real time. From Shusterman et al 2011. While I do not speak for or represent the Carleton lab, I will say the lab was quite surprised when this paper came out. We had been recording in awake head-fixed mice for some time, and not seen responses as strong as this. Since the paper has come out, though, we have started to get responses more in line with their data. (Which makes me wonder about how we find the results we are looking for.) It is nice to see, though, that such a simple reporting of olfactory bulb coding can be published in a high impact journal. My biggest issue with the paper are those warped breaths. The breathing cycle is generally regular enough that warping breaths will yield only mild increases in precision. Yet, I have to wonder, how does a neuron know where it is in the breathing cycle? In other words, if it has been 50 ms since the end of inhalation, how does a neuron know whether the next breath is 100ms or 200ms away? You can solve this problem with synfire chains a la birdsong representations in HVC, but there the motor and auditory pathways are linked, whereas here they are divorced. I hope to post counterexample data in the future. To follow that paper, they next turned to behaviour. They asked, if individual neurons code the phase of sniffing, can the mice perceive sniff phase as well? To artificially stimulate different sniff phases, they used mice that express channelrhodopsin in the olfactory epithelium (OMP-ChR2). They then implanted a cannula with a light fibre in the epithelium, and stimulated with 5mW pulses. To show that mice were receiving artificial olfactory input, they showed that mice could discriminate between air puffs with light vs air puffs without light, in a go/no-go task. Once they established that mice could sense the light stimulation, they then set out to test whether they could discriminate light stimulation at different times during the sniff phase. They used a small cannula to detect the start of inspiration and exhalation, and stimulated either 32ms following inhalation or exhalation (panel a, top). When light was presented during inhalation, the mice were expected to lick; when light was during exhalation, it was no-go. As you can see below, the mice were initially unable to discriminate the stimuli, but quickly learned to discriminate between light stimulation during inhalation versus exhalation. Mice can discriminate between different parts of sniff phase. a. They detected the breathing cycle, and stimulated with light either 32ms following inhalation (go) or 32ms following exhalation (no-go). After training, mice were able to discriminate between the stimuli. b. Here, no-go stimuli were presented 50-100ms following the go stimuli. Mice were able to discriminate differences of ~10-20ms. Once they established that mice can discriminate inhalation from exhalation, they then set out to find the minimum discrimination interval. Here the go stimuli was 32 ms after inhalation, and the no-go stimuli was between 5-100 ms following the go stimuli (panel b, above). In general, mice were able to discriminate ~12 ms differences between the two. Between these two papers, the Rinberg lab showed that neurons can encode the precise timing of olfactory information. The odor tuning of neurons is rather broad, with 59% of cell-odor pairs responding. And this precise timing of stimuli is discriminable to the mice, which means it is possibly important for detection. Regarding your comment, "... but there the motor and auditory pathways are linked, whereas here they are divorced." Surely this means that there is (as of yet undiscovered) corollary connection between the respiration circuity and the mitral cells? Yeah, Stephen Shepherd pointed this out in the next post. However, I don't think there is any evidence (now) that those areas are anatomically or functionally connected. I personally lean towards a time-coding rather than phase-coding.